The Christmas tree season begins the day after Thanksgiving and runs through December 23. If you can, come on a weekday–you’ll avoid the crowds. 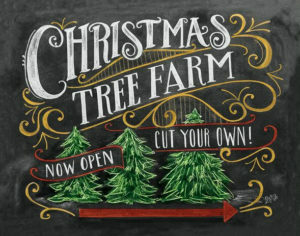 Remember that December days are short, so you should plan to cut your tree by 4:30 p.m.
Our Christmas tree farm provides saws, will process your tree (shake,drill, and bail) if needed, and furnish extra twine for you to tie your tree to your car. * We can put your tree on your car for you, but we cannot tie it to your car due to liability concerns. * Thank you for your understanding! Be sure to bring sturdy shoes, warm clothes, and gloves. See our page on trees to find the species that best suits your needs. Make sure that the tree you cut will fit in your home–many people bring home trees that are too large since trees appear deceptively small when they’re outdoors. Please cut the tree close to the ground. We have a waiver and instructions here and care tips here. Most of our customers tie their trees onto roof racks, or put their trees in the back of their pick-up trucks. Check with your local waste management company for pick-up days or drop-off points.